The new studio album from Paul, Lauren and Frode. 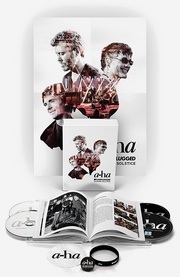 Includes the singles "Night Watch" and "January Thaw"
a-ha surprised the audience at Oslo Konserthus last night, by not only playing the Hunting High and Low-album, but also the entire Scoundrel Days-album – 20 songs in all. Another surprise was that Paul and Magne had decided to change sides on stage for the first time since 1994. The audience of 1300 people included Queen Sonja, Princess Märtha Louise and her husband Ari Behn. Aftenposten has an article about the concert here, while Dagbladet has a review here. There is also a review in Dagsavisen (5 out of 6) and an article at popsenteret.no. (…) Adding string arrangements to cool and quite minimalistic synthpop is a challenge. 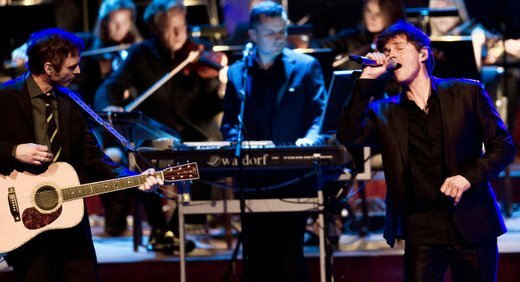 The strings should preferably seek out the darkest and coldest corners, and bring out the underlying unease and dark melancholy that run through the early a-ha material. But Kjetil Bjerkestrand’s bombastic, light romantic string arrangements did little else than rub the a-ha material with the hairs. On its best, it gave the durable a-ha classics a sort of extra pomposity, predictably mood-enhancing, but not too annoying. 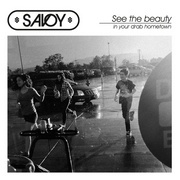 Luckily “Here I Stand And Face The Rain” and “Soft Rains Of April” – both strong endings on their respective albums – benefited from effectively sweeping and ending credits-like dramaturgy. In the worst cases – where “And You Tell Me” stood out as a horrible low point – you got an overly sweet Disney-Christmas feeling. On Friday, the audience in London will get a chance to hear the same concert at the Royal Albert Hall. 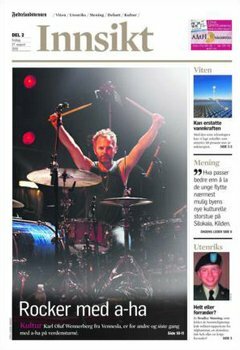 Morten on the front page of Stavanger Aftenblad Pluss. The second “Hunting High And Low”-concert that Magne mentioned earlier this week, has now been officially announced on a-ha.com. The concert will be held at Oslo Konserthus on 4 October, and will benefit Mercy Ships – a Christian organization that operates hospital ships in developing nations. Only a limited amount of tickets will be available. There is a lot of promo for the Norwegian concerts going on at the moment. Morten is on the front page of Stavanger Aftenblad’s weekend magazine today. Inside there is a 3-page interview. 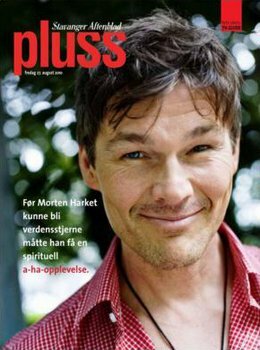 There is also a 2-page article about Morten in Vårt Land today, while Bergensavisen has an article about a purchase agreement for a guitar amplifier that Morten bought in 1976 (!). Fædrelandsvennen has a 2-page interview with Karl Oluf, who talks about his experiences touring with a-ha over the last two years. Karl Oluf on the front page of Fædrelandsvennen’s culture section. In Bergen, the last preparations are being done before the concert at Brann Stadium tomorrow night. Between 25.000 and 30.000 people are expected to attend the largest concert ever held in the city. Bergens Tidende has documented the process of building the stage with an article and slideshow here. You can also view a 360° panorama picture of the stadium. And the 25 collection has finally entered the official Norwegian album chart (at number 9), as it’s now also available outside the COOP chain – earlier than originally planned. In Europe as a whole, the album is at number 8 in its second week, as Billboard reports. It’s currently number 3 in Germany, 6 in Switzerland and 14 in Austria.